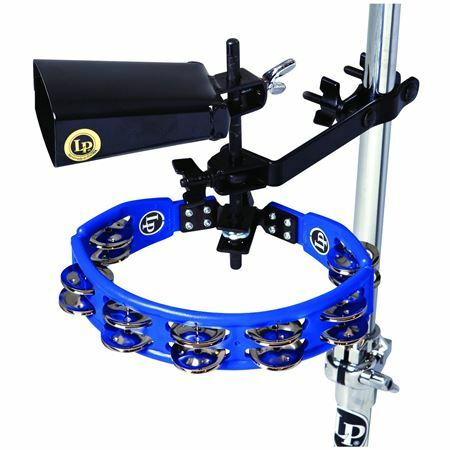 Shop Latin Percussion LP160NY-K Tambourine and Cowbell with Mount Kit from AMS with 0% Interest Payment Plans and Free Shipping. A perfect add-on accessory for any drum kit or percussion setup. This inclusive set has the LP Cyclops City Tambourine which has nickel-plated steel alloy jingles that produce a bright, projecting sound with rounded edges that provide extra durability for drumstick hits. The handmade lively LP City Cowbell is made in the USA and produces a dry, crisp sound. The ergonomic and adjustable Gibraltar SC-AM1 mount allows perfect placement. Stand is sold separately. The perfect addition for my set. Have been looking for a tambourine and cow bell holder to add to my set and this fit the bill perfectly! Fun add on to my drum set. Makes me smile when I play this. Very nice for the price, the cowbell is a real high pitch and almost sounds like a metronome (playing Feeling This by Blink 182). Only downside is you have to separate the two from the mount, otherwise every time you hit the cowbell the tambourine shakes, too.